Original & Genuine MAG-322/ MAG 254 STB. From all around the world. HD Channels - Video on Demand Available - Movies / TV - EPG Guide. 2 x AAA Battery for Remote. Official User Manual + Help Guide. What is required to make it work? Ans: You need active internet connection and you can use it anywhere in the world. Ans: We will help you out with full setup and our item comes with full 12 month support. Best After sale support ever and you will surprise. Do I need to update anything like other satellite receivers? Ans: This is not a satellite receiver, so doesn't affect if satellite frequency changed, You can just keep watching without any issue. What kind of internet speed do I need? Ans: Basic internet package is fine, if you have download speed around 10 MB, it will be good enough. Most basic Broadband package have good speed connection, NOTE: if you very slow speed, you may experience now and then freeze. Don't Miss Your Favorite TV Show. Let us just surprise you with our Quality and fast Setup support. Now you choose what you want. Product imported directly from Infomir, Germany warehouse. 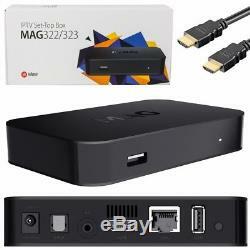 This box is Full HD compatible - Perfect item for Hotels, Hospitals, Universities and many corporate offices. We will do our best to resolve any queries or technical issues. We do not condone the use of illegal firmware/channel listings/and satellite receivers and such will not provide any. 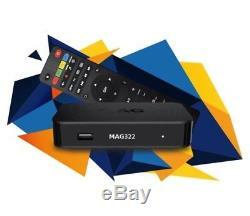 This item is a free to view PVR satellite receiver. THIS IS NOT A ILLEGAL DE-SCRAMBLING SERVICE OF ANY NATURE. WE DO NOT REPRESENT ANY MEDIA COMPANY. The item "MAG322 IPTV Set Top Box With 12 Month's Platinum Gift Warranty" is in sale since Monday, July 10, 2017. This item is in the category "Sound & Vision\TV & Home Audio Accessories\Internet TV & Media Streamers". The seller is "satellitetrades" and is located in Bradford, West Yorkshire. This item can be shipped to United Kingdom, Austria, Belgium, Bulgaria, Croatia, Cyprus, Czech republic, Denmark, Estonia, Finland, France, Germany, Greece, Hungary, Ireland, Italy, Latvia, Lithuania, Luxembourg, Malta, Netherlands, Poland, Portugal, Romania, Slovakia, Slovenia, Spain, Sweden, Australia, Canada, Brazil, Japan, New Zealand, China, Israel, Hong Kong, Norway, Mexico, Singapore, South Korea, Switzerland, Thailand, Chile.